Today is February the 14th, Valentines Day, all over the world and there is a plethora of love themed recipes emerging all over the blogosphere and social networking sites, mostly in the shape of hearts and cupids. I shall do no such thing today I assure you. I am as sentimental and romantic as the next person but I’m not clichéd. I think it comes from having been a wedding photographer in my twenties at several hundred weddings. There are only so many fluffy white dresses, tacky cake toppers and bridal waltzes shuffled to in a cloud of dry-ice accompanied by “Everything I Do” that I can take before I seriously consider taking up a new career as a windscreen washer on an inner-city Sydney street corner screeching “fifty cents an’ I’ll clean ya win-screen! !” whilst wielding a squeegee and spray bottle, dressed in filthy clothes and hurling abuse at those who refuse me. Trust me on this, they’ll drive you to it. So I decided to write about figs instead of heart-shaped cupcakes or chocolate bonbons (maybe next year). And you ask why pick figs? Well for starters it’s fig season here in Australia and I walk past a fig tree most days when I walk my young son to preschool. I live on a street in an area with lots of Italians and in most front yards there is a veritable market garden growing. Tomatoes, grapes, olives, avocadoes and figs to name just a few of the things I see. The other reason I would like to discuss figs is because they are so sensual, a fitting fruit to discuss on Valentines Day as there will probably be a lot of hopeful individuals suggesting coffee at their place tonight after a romantic evening with a set-menu dinner in a restaurant full of tables set for two. 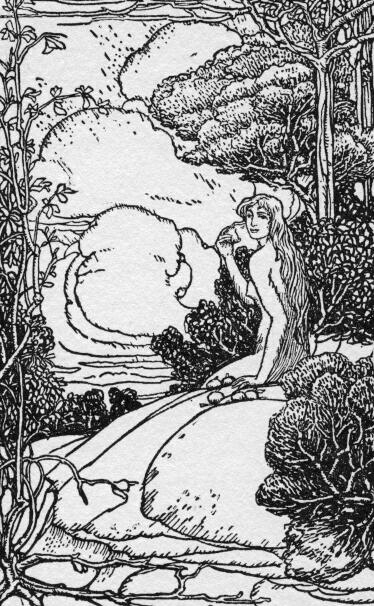 Regarding the fig however, there are theologians who claim that it was this particular fruit, not the famous apple, which in fact tempted Eve in the Garden Of Eden. Some even say that the broken-apart fig resembles the more private area of er, a female’s anatomy. Furthermore there are historical legends that claim that the fig is an aphrodisiac. (At this point I can’t help but imagine a toga-clad Caesar-esque Roman emperor staring at his lover with lust-filled eyes across a lavish banquet table as he voraciously chomps into a fig.) Perhaps the reason for this claim is because figs contain both potassium and iron, two nutrients essential to sexual health. Food for thought huh? Anyhow, enough about private parts, lusty Romans and the condemnation of women by God, and more about the recipe. As I am somewhat obsessed with the flavours of the former Ottoman Empire (thanks to renowned Bulgarian-born London chef Silvena Rowe who went into detail on this subject for me some years ago whilst we were working on a project together overseas. If you are not familiar with her work do look her up, she is a truly amazing cook). Ottoman cuisine in particular I find very sensual with its use of aromatic spices, floral waters and fruit and is reflected in the food of Turkey, the Balkans, parts of Russia and the Middle East. So I decided to create a Valentine’s recipe with these flavours to celebrate romance in a less predictable manner (than the aforementioned heart-shaped cupcake). 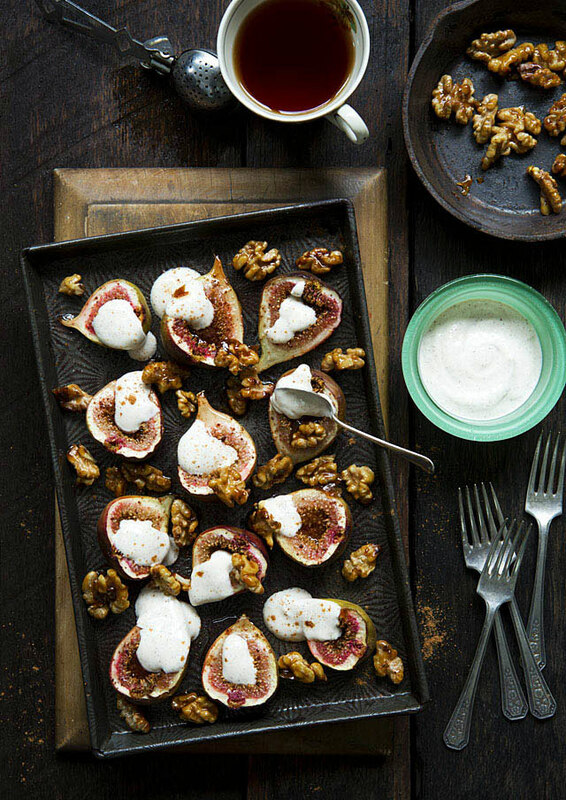 Baked Figs With Rosewater Yoghurt and Candied Walnuts are a mélange (gosh I love that word) of romantic sensual flavours and textures perfect for sharing with a sweetie, or enjoying on your own. After all, who said Valentines Day can only be enjoyed as a couple? Besides, there’ll be more figs for you, so happy Valentine’s Day. Serves 4 as a light dessert. Prep time approx 30 mins, cooking time approx 30 mins. 1. Preheat oven to 180˚C (approx 350˚F). Place the figs cut side up on a baking tray, drizzle with honey, sprinkle with the ground cloves and bake for twenty minutes. The figs will have softened slightly but will still retain their juicy freshness. Set aside. 2. Whisk the strained yoghurt with the honey, rosewater and cinnamon. Set aside. 3. Place a non-stick pan over medium heat (I use Neoflam) and once pan is hot, melt the butter until it just starts to slightly caramelize, then add the sugar and honey stirring constantly. Once dissolved add the walnuts and stir to coat evenly. 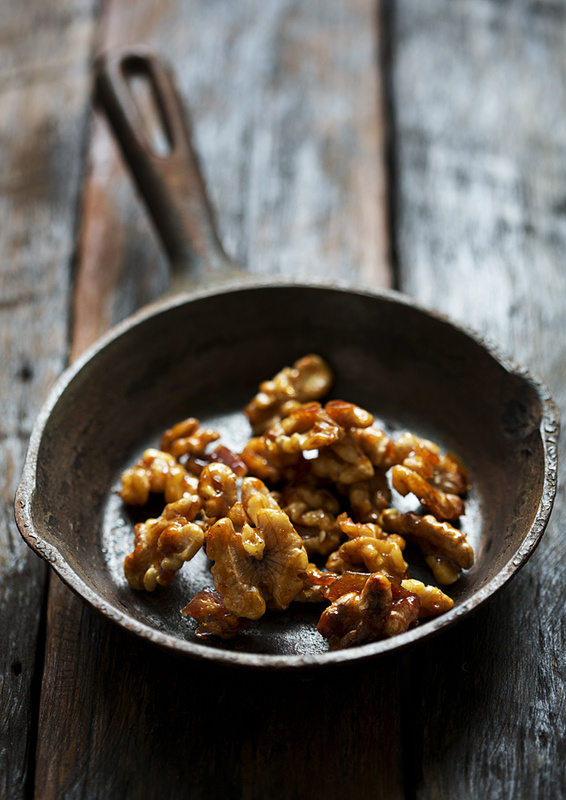 Turn off the heat, stir a little more then tip out the candied nuts onto a metal tray lined with non-stick baking paper to cool. I spread them out so they don’t cool in a big clump. 4. Arrange the figs on a platter, spoon the yoghurt over and scatter the nuts over the fruit. If desired sprinkle a little more cinnamon over the entire platter. It was dark, romantic and moody all the way, like the fruit itself, to create this shoot. The vintage baking tray was a wonderful find in a country NSW op-shop. The vintage green Pyrex bowl, dessert forks, bread board and antique tea cup were all found in local op-shops. The cast iron fry pan and tea strainer were picked up off the street in council hard rubbish collections. The background surface is stained recycled fence palings banged together by my neighbour Jamie who is as mad about upcycling hard rubbish as I am. The only light used in this image is window light. gorgeous! I love candied nuts, figs and yogurt so putting them all together for this elegant snack is very appealing! I’ve seen recipes requiring rose water and never knew where to pick it up. Now I know! love the overhead shots and this recipe! Will follow this blog.